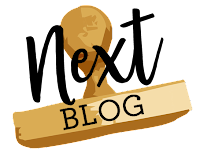 I purposefully designed this project to be EASY, and to use few supplies. 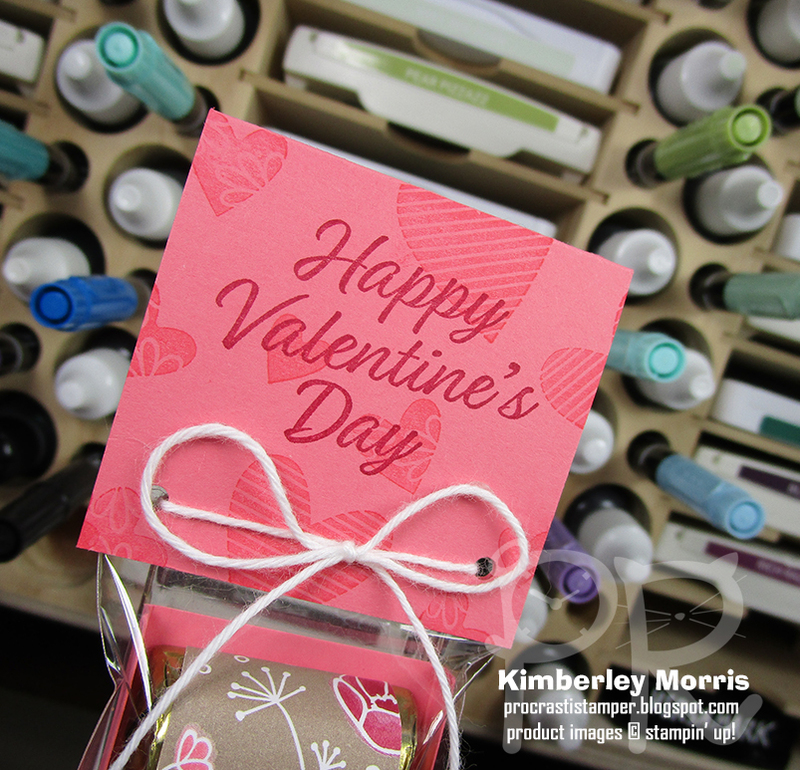 I personally think this makes an excellent #simplestamping Valentine project! With the enclosed snack of 3 Hershey Nuggets in the 2" x 8" Cello Bag, it is definitely a Sweet Treat I'd give to another adult, as opposed to being a child's Valentine treat. For this project, I cut the 2" x 8" Cello Bag to only 5-1/2" tall. 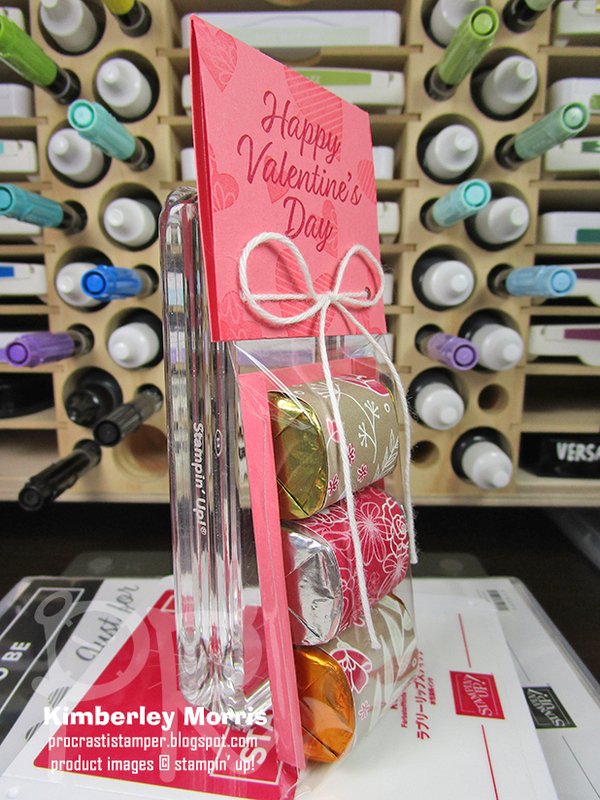 I then used Flirty Flamingo Cardstock for the topper and the little "tray" inside the bag. The topper is 2-1/8" x 4", scored in half at 2" so it folds over to 2-1/8" x 2". 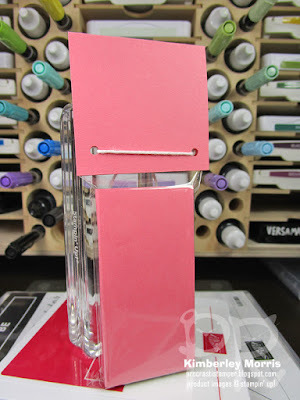 The hearts on the topper were stamped with the Flirty Flamingo Ink Pad, stamped OFF once. The greeting was stamped with the Lovely Lipstick Ink Pad. The Flirty Flamingo Cardstock "tray" inside the bag is 2" x 3", scored at 1/4" on each long side. The Hershey Nuggets have been wrapped with 1" x 3" pieces of All My Love Designer Series Paper (DSP), which are adhered with just a touch of SNAIL Adhesive. I only adhere the DSP to itself, so the chocolate just slides out...this a super strategic move that allows you to remove surplus candies if you have a nibble attack, and then slide the DSP wrap back around a new chocolate!!! I really like my treat bags to be resealable, so I chose to punch holes through the topper and bag with the 1/8" Handheld Circle Punch. Then, I threaded through about 12" of Whisper White Solid Baker's Twine, and tied it in a bow. You can see how the project looks from the back, in the above picture. Plenty of space on the back of the topper to put your "handstamped by" information, and/or a to:/from: designation. Here's one last shot of the front, a little closer. 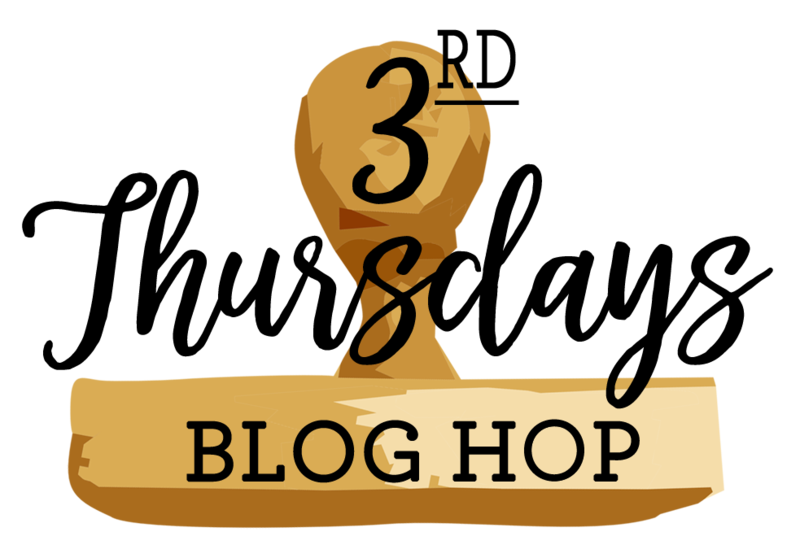 They are adorable, yet simple, and inexpensively made. 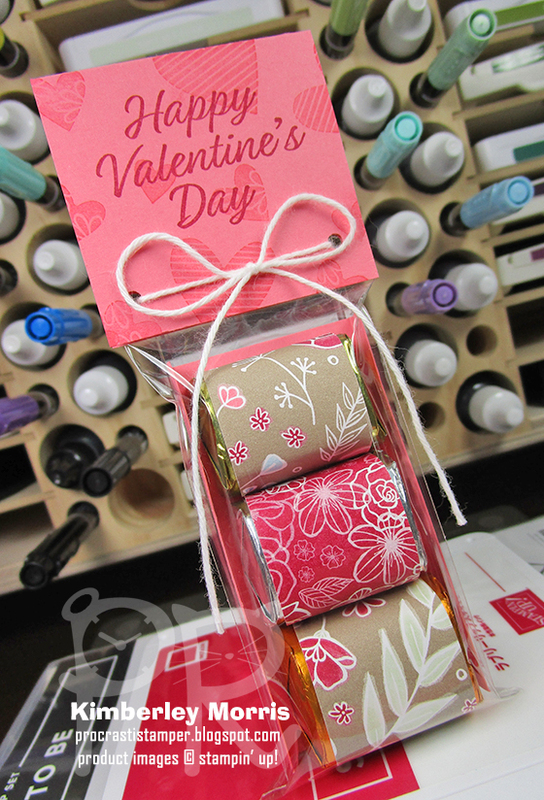 With just one package of All My Love Designer Series Paper, you'd have enough decorative wrappings to cover a whopping 576 chocolates!!! Divide that number of chocolates by 3 per pack, and you can make 192 of these treat holders. If you want to make that many, be sure to grab at least 2 packages of the Flirty Flamingo Cardstock, and 3 packages of the Whisper White Solid Baker's Twine, and you should be good to go! 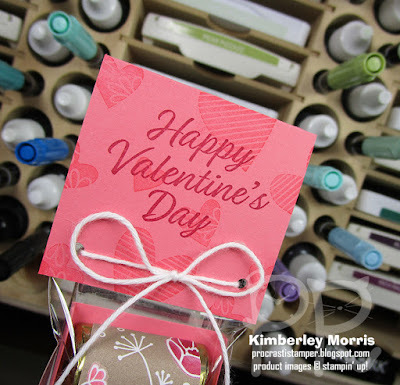 Don't forget to add the Flirty Flamingo Ink Refill and the Lovely Lipstick Ink Refill to your order if you are going to be doing all that stamping! 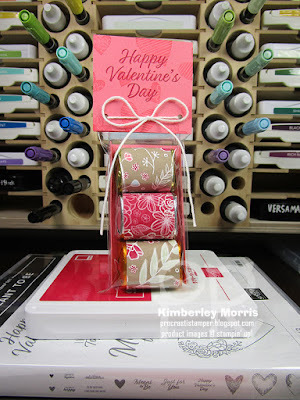 Stampin' Supplies: Meant to Be Cling-Mount stamp set, Flirty Flamingo Cardstock & ink pad, Lovely Lipstick ink pad, All My Love Designer Series Paper, Whisper White Solid Baker's Twine, 2"x8" Cello Bags, 1/8" Handheld Circle Punch (optional, if you'd like to tie your treat bag closed), SNAIL Adhesive, Paper Snips, Stampin' Trimmer (for cutting & scoring), Simply Shammy (to clean stamps).